Your medical doctor just told you that you have osteoarthritis based on an X-ray, MRI or CT scan, and you want to know the best treatments, right? Stop right there. Almost everyone over 40 years of age has osteoarthritis. That means that almost everyone over 40 should have pain right? That’s simply not true. The truth is research has proven that there is no correlation between the severity of osteoarthritis and your pain. I see people with severe osteoarthritis on X-rays all the time, yet they have stiffness in the morning with a little bit of pain or occasionally moderate pain. Rarely do I see people with severe osteoarthritis as the cause of their pain. Want to know more about how imaging correlates to X-rays and MRI click here. What Is The Best Way to Deal With Osteoarthritis Myself? You can lessen the shocks on your joints by losing weight. For example, if you find going down the stairs especially difficult for your knees, losing weight can be the key. When you go down the stairs you are putting 3-5 times the pressure on your knees compared to walking. By losing 10lbs or 4.5 kg of weight you can decrease the pressure on your knees by 50 lbs or 22.5kg when going down the stairs. Joints are made to move. If you don’t move, research has shown that joints start to get stiff. More specifically they develop adhesions, fat deposits, cartilage deposits etc… over extended periods of time without movements. In the extreme example when you break your elbow and have your arm in a cast for six weeks. When you get your cast removed your elbow cannot move very much. For most of you simply waking up in the morning means that you are stiff in various joints. Exercise helps to reduce pain and stiffness and increases flexibility and strength. Depending on the exercise you can also increase muscle endurance. On all fours with your knees under your hips and hands under your shoulders. Inhale and let your belly fall downwards toward the floor as you look up towards the ceiling for 2 seconds. Keep the ab muscles tight. Exhale and arch your back up as far as it will go or until you feel pain. You should not feel pain with this exercise, otherwise, you are going too high. At the same time bend your neck forward and look toward your navel. Stand with your back to the chair. After a few sets you probably won’t need the chair. 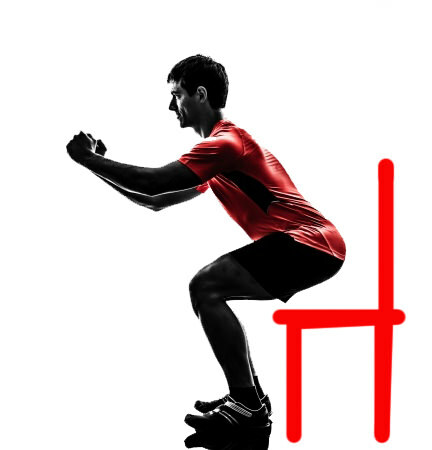 Make sure to arch your lower back when lowering yourself down to the chair. Take a big step forward with one foot and let the other knee almost touch the ground. To make it easy at the beginning you can bring your knee down only halfway. Remember to keep the arch in your back called a lordosis. 3 sets of 10 for each leg. This exercise helps you strengthen the muscles that pull your shoulder blades together. By strengthening these back muscles the exercises help you support your upper back and neck and shoulders in the proper position. Thus your most of your upper body including your fingers and hand are helped with these exercises. This exercise helps your upper back, shoulders, hands and fingers. It would help the elbow too but most people don’t get osteoarthritis in the elbow unless they had trauma to it. Pull the band at the same level when your elbow is flexed to 90 degrees like the picture above. Do 3 sets of 20 to start. As you get stronger do 3 sets of 50. Hi Vivian, Do you have your program in book form and DVD? I don”t like e books! I have osteoarthritis and osteoporosis among other things. Several years ago, the doctor tried to terrify me into taking that awful drug for the bones. He said I would become a hunchback, etc. if I didn”t take it. I never took it because it sounded scary. I discovered about 4 years ago it damages the jaw bone! Thanks for your question Vinfer. Your osteoarthritis cannot be changed but your osteoporosis can be changed. The most important thing you can do is to do your exercises. However, depending on how bad your osteoporosis is these exercises may not be for you. You will have to check with your medical practitioner to see if they are appropriate. If so they will help alleviate any symptoms related to osteoarthritis and increase your bone density. A double win. The above is an opinion and not a recommendation. Hope that helps your osteoarthritis.